The GAZE LGBT Film Festival has launched the official programme ahead of the 26th edition of the festival, which runs from August 2nd-6th. Taking place at The Dock, 7 Hanover Quay last night, July 10th, the launch saw a number of special guest, filmmakers and well know faces in attendance. The GAZE LGBT Film Festival announced an exciting line-up of Irish and international guest filmmakers taking part in the festival, which runs from 2nd - 6th August 2018 at Light House Cinema, Smithfield. Filmmakers will be discussing their work and meeting audiences during Q&A’s after films that explore a diverse range of subjects and stories. Major titles announced include ‘Disobedience’, which stars Rachel Weisz and Rachel McAdams. A woman returns to her Orthodox Jewish community that shunned her for her attraction to a female childhood friend. Once back, their passions reignite as they explore the boundaries of faith and sexuality. The film is directed by Sebastián Lelio (‘A Fantastic Woman’). Also confirmed to screen at the festival is ‘The Miseducation of Cameron Post’, starring Chloë Grace Moretz and Jennifer Ehle. Based on the book of the same name by Emily M. Danforth, the film tells of Cameron Post, a 12 year old Montana girl, who is sent to a 'de-gaying' conversion camp after her parents die in a car crash and she is sent to live with her conservative aunt. The film will also have a special screening at Pálás in Galway as part of GAZE on tour. The opening film on Thursday August 2nd is ‘Riot’, which celebrates LGBT trailblazers Down Under, telling the story of the roots of Mardi Gras and the start of the long road to their Yes vote for marriage equality. The closing film of the festival is the inspirational story of Scott Jones, following the story of this young gay musician who was attacked and paralysed from the waist down. It captures both the trauma and triumph of its character’s journey in a respectful, loving and nuanced way. Screenings form a key part of the GAZE 2018 Film Festival programme, which will show the very best in contemporary LGBT films, but will also include discussions and special events including a special Queer Family Event on Saturday 4th August, which is tailored to appeal to all families. This will include a special screening of ‘Paranorman’, and Drag Queen Story Time at The Gutter Bookshop in Temple Bar. 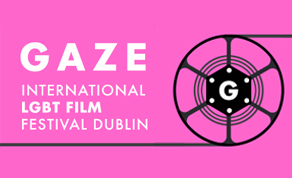 The GAZE Film Festival is sponsored by Accenture, funded by partners the Broadcasting Authority of Ireland, and The Arts Council, and is supported by Venue Partner Light House Cinema.